I recently did a review on three Gerard Cosmetics lipsticks and discussed whether or not they are worth the hype. While swatching and reviewing the lippies I realized that I had a similar dupe for Cherry Cordial, a deep dark red shade. Sin| Sin is a really popular shade from MAC Cosmetics that is a deep brown toned red. The finish of this is very matte and it is very opaque on first swipe. Because of it’s matte finish it lasts a long time and leaves a stain behind on the lips. Even though it is opaque with one application, you can deepen the shade and build it up so it is more dramatic. Cherry Cordial| This shade is a deep berry red shade that is pretty matte, but it has a slight sheen to it. You have to build the color up and apply it at least 5-7 times to really get a deep opaque color. On first swipe it isn’t that pigmented, and that was the most disappointing part about this lipstick for me. I was expecting a better formula and pigmentation for the price. The Difference| The shades are almost the same when swatched, but when applied to the lips you really can’t tell the difference. 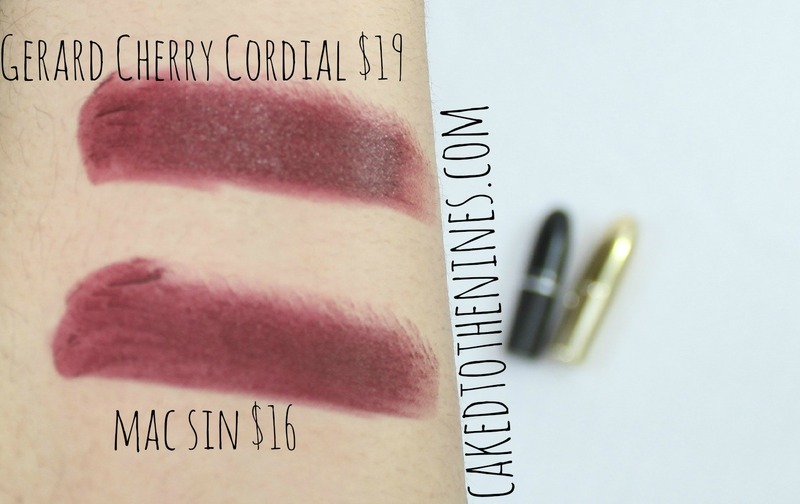 The only main difference is that Cherry Cordial has a slight sheen to it, while Sin is completely matte. Personally, I like Sin a lot better because it is $16 whereas Cherry Cordial is $19 plus shipping (unless you purchase $75 worth of items which would make you eligible for free shipping). Sin is cheaper, but it also has a better formula so you get a better product for your money in my opinion. So, if you were to get one out of the two I would recommend Sin! I know this dupe isn’t something that is significantly cheaper, but I thought I would let you know that if you are looking to purchase Cherry Cordial there is a dupe that is a little bit cheaper, but better quality out there. Have you tried either lipstick? Let me know in the comments below!